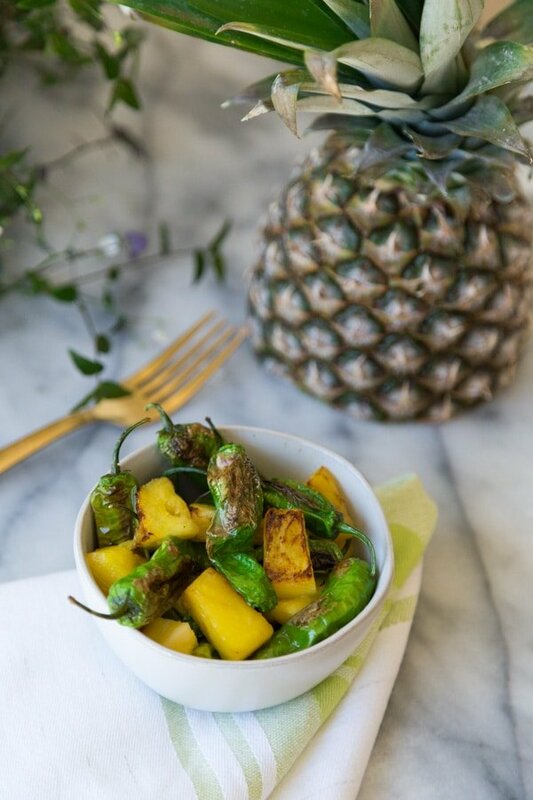 Spicy and sweet is the perfect combination in these shishito peppers with pineapple! They’re a perfect side dish to impress your friends with your trendy taste in food! Today is the LAST day to enter the epic GIVEAWAY that we’re hosting to celebrate tomorrow’s release of our cookbook, GREAT VEGAN BBQ WITHOUT A GRILL!!! Trust us, you want to enter! 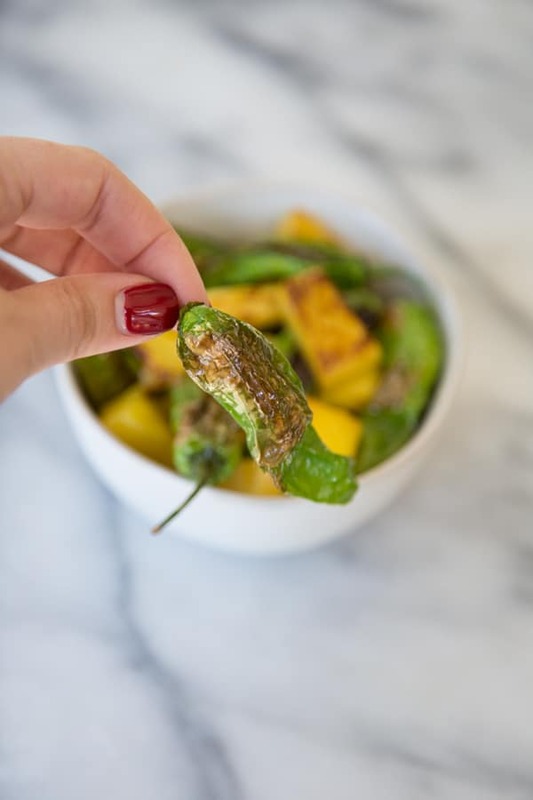 Click this link to enter and then come back to get this awesome pineapple and shishito pepper recipe. Recently I’ve been noticing that shishito peppers have been everywhere! Seriously. You can pretty much walk into any restaurant and see this dish on the menu. However, even though they’re delicious, they’re typically doused in oil. We’ve changed this tiny detail. 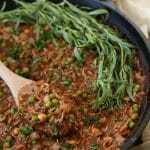 So, how do you make an oil coated dish taste just as good, while still being healthy? You play off of the food’s natural flavors. Because shishito peppers have a little kick, pair them with something sweet and you’ll have the perfect balance. Hence, the pineapple. The great thing about the combination of spicy and sweet is that it pairs well with almost anything. 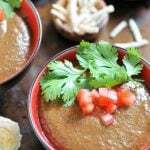 Craving something in the Mexican spice palate? Use these peppers as a side dish with rice and serve with our AMAZING enchiladas! For an Asian twist serve with our raw pad Thai. Or, even throw it next to one of our BBQ sandwiches, or serve it with one of our seitan dishes from our cookbook (released March 20th) for a Hawaiian BBQ theme! First– Heat a small skillet on medium-high heat with tiniest bit of oil. Second– Once heated, throw in your pineapple, peppers, and garlic. Periodically toss to make sure the peppers aren’t burning. Third– Add some Himalayan sea salt and enjoy! 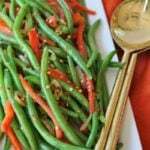 See how easy it is to make a fabulously flavorful and healthy shishoto pepper recipe with sweet pineapple and garlic? Make this and come back and let us know what you think. We love hearing from you! And, don’t forget to take a picture of your beautiful creation and share it with us @veganosity on Instagram. 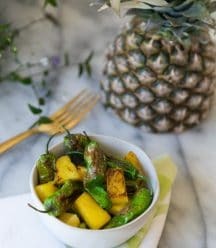 Pan roasted shishito peppers with sweet roasted pineapple. 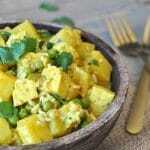 The perfect gluten-free and vegan snack, side dish, or appetizer. Heat a small skillet on medium-high heat with your tiny bit of oil. Once heated, throw in your pineapple, peppers, and garlic. Periodically toss to make sure the peppers aren’t burning, approximately 10 minutes. Add some Himalayan sea salt and enjoy! 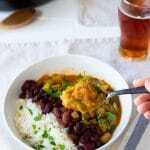 Yum, perfect healthy spin on a great recipe. Can't wait to try - thanks! Thank you! Let us know if you try them, we'd love to know what you think.